Not much of the news coming out of Turkey these days is positive – refugees, bombs, riots, censorship and the usual rhetoric from the imperious Erdoğan. The western media do so love to stoke up a drama. You could be forgiven for thinking the place is falling apart. Well, it isn’t. But the headlines are putting visitors off. According to some estimates, bookings by Brits are down by over a third. A glance at the travel agent’s window reveals the bargains to be had, reflecting a tourist trade going through lean times. It would be foolish to suggest there aren’t any problems but Turkey remains one of the safest holiday destinations anywhere. It’s been four years since we returned from Turkey and we’re content with our lot in old Norwich Town. The slowish pace of life suits us well. But, we’re often nostalgic for our easy come, easy go days of Bodrum. During one particularly wistful afternoon in the boozer, Liam and I took a drunken stagger down memory lane. Over the last few years I’ve scribbled a word or two about my best bits of Turkey and I’ve even won writing competitions with my musings. So to cure me of my melancholy, Liam suggested I put them all together. So that’s what I’ve done. And very cathartic it was too. 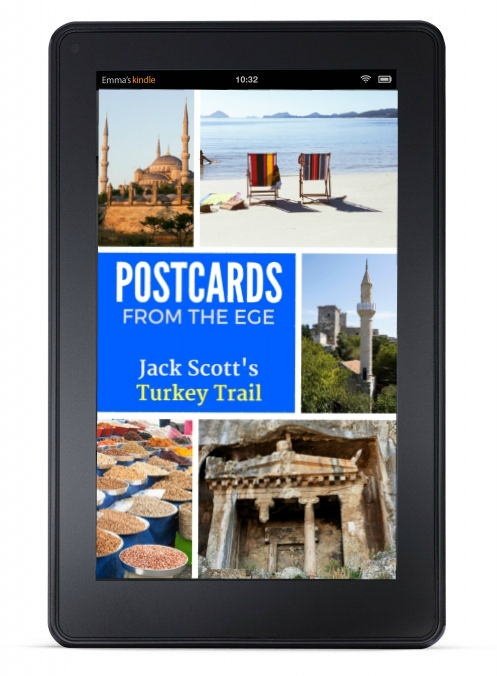 I’ve called it Postcards from the Ege, Jack Scott’s Turkey Trail. With such an immense political and cultural heritage, it’s no surprise kaleidoscopic Turkey is such a feast – a prime cut of authenticity, seasoned by the West and spiced by the East. Jack Scott knows a thing or two about the country. He lived there for years and travelled widely – to Istanbul and along its south-western shores from Izmir to Alanya. In Postcards from the Ege, Scott shares some of his must-sees and personal highlights. Follow Scott’s trail. Come to Turkey. The e-book has just been published on Kindle by Springtime Books. It’s a steal at a couple of quid and if it encourages people to sample the extraordinary land we used to call home then that’s all to the good. The sequel to Perking the Pansies to tie up the fraying loose ends and bring our Anatolian journey to its crashing conclusion is coming along very nicely. Expect a few surprises. I have a working title of ‘The Sisterhood,’ so this may give a little clue about the main theme. In the meantime, a gentle plug for the books already on the virtual and actual shelves. Hey, a boy’s got to sell his soul to bring home the bacon. The books are widely available in multiple formats. And if you buy direct from me, I get to keep the lion’s share of the take. For more information, check my website.